As a parent, it’s easy to see that everything is competing for the attention of your children. We live overworked lives and often feel squeezed for time. There are lots of reasons why playing board games as a family makes sense. 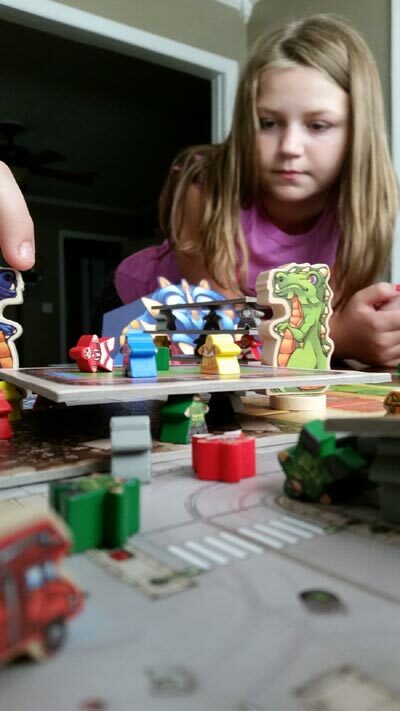 We pulled together our top 5 to share what we’ve learned from gaming with our family of 5. Whether it’s their phones, tablets, TV or video games, some piece of technology is always competing for your child’s attention. Carving out time to be away from these devices can be so rewarding. Board games help bring us back into the physical world, and hopefully disconnect from the digital world for a couple minutes. I’m not here to demonize technology. In fact, it’s the industry I work in. I am, however, here to make a case for families to gather around the table and interact without a screen in front of them. If you’re not already doing this, plan a family game night with everyone in the family. Setting some guidelines of “no devices at the table” and turning off the TV while you’re playing can offer a great break for our technology saturated lives. The board game industry has grown by leaps and bounds over the past 15 years. There is a theme for just about anything you can think of. Pick a theme that connects with your family and have conversations around that topic at the table. Our kids have really taken to Ticket to Ride this year. While playing a game like this, ask your kids what city on the map would they love to visit and why. You can take a game like Best Treehouse Ever to hear your kids dream about the coolest tree house they could imagine. Asking questions while playing games like these will open up your child’s imagination, and you’ll learn more about how their mind works. Playing a game set in the middle ages or Egypt might even give you an opportunity to share an interesting piece of history with your kids. Could you imagine if your child accidentally learned something new while having fun? If your child is a teenager, you may not believe this next section. These moody little people might seem like they would rather move to another country before being seen in a car with you. If we look at statistics, we find that’s not actually the case. With the stress of work, responsibilities, paying bills, and everything else life throws at us, we can forget to slow down and enjoy time together. A couple weeks ago I found research from October 2016 that surveyed people about “family happiness”. Playing games as a family took 3rd place behind family vacations and celebrating special occasions. The survey also showed that the number two reason that brings the family down is “Parents having to work too much”. Spending time with your kids means more than you know, and kids are being honest about this. When participants in this study where asked, “What would make your family happier? New big-screen TV or a weekly family game night”, the response was overwhelmingly in favor of a game night at 88%. When participants were asked about “weekly happiness habits”, 52% of families mentioned a weekly board game or video game night. Believe it or not, our kids want our attention, and spending time with them matters. Do you remember back in the day when the person who worked hard, practiced and did well got a trophy? Those were the good days. Over the years we’ve realized our 3 kids are different when it comes to playing games. One of them is a sore loser, another one talks a ton of smack during the game, and one of them couldn’t care less if she lost by a million points. They are drastically different in how they handle winning and losing. It’s been eye opening to see them change and evolve as they play more games and develop strategies. We’ve had great teaching moments when they’ve lost. Even in winning, the kids are being taught how to be gracious winners and not brag about how great they are. Playing cooperative games like Pandemic, Forbidden Island and Castle Panic are great for teaching kids that they can’t win alone. Working together as a team and sharing a victory/defeat shows our kids that we can accomplish big things when we work together. Co-op games aren’t for everyone, but we love seeing how our kids work together for a common goal. Around our house we are big on the “i” word. Be intentional with everything you do. You don’t accidentally become great friends with someone. You have to be intentional with your relationships, and that goes for your kids too. Working together as a team and sharing a victory/defeat shows our kids that we can accomplish big things when we work together. Be intentional to game with your kids. With the stress of work, responsibilities, paying bills, and everything else life throws at us, we can forget to slow down and enjoy time together. Set aside time with your kids to play board games, eat a meal together at the table or even go for a walk together. Each time you do this, you’re saying “I’m choosing time with you” over all the craziness of life. There are two memories that stick out so vividly when I think about board games and my childhood. One is when my Mom and Dad taught me to play the game Stop Thief. The other was the time my Dad came home with a copy of Kerplunk that he bought when he was away for a couple days on business. I believe these memories stick out so vividly because they took time out of their schedule to make time around the table a priority. These are only 5 reasons why we game together as a family. We want to know why your family games together, or why you might need to start scheduling family game nights. Post in the comments below and add more wonderful reasons for sharing this hobby with our family.